Confession: I hated spanakopita for basically my entire childhood. I liked spinach, I liked feta, and I liked flakey pastry stuff, but spanakopita, or the Greek answer to spinach pie, was on my bad list. I probably had a half-decent reason for disliking it at first, but it soon became habit and I just refused to let it anywhere near my plate. It wasn’t until I was 12 or 13 that I realized that this stuff is decidedly delicious. To make my spanakopita even healthier than the original, I use olive oil between the layers of phyllo pastry instead of butter, use an assortment of greens including a ton of kale, and scale back on the dairy, adding enough feta to give it it’s signature taste without becoming overwhelmingly caloric. Spanakopita is the perfect big-dish meal because leftovers are easy to slice and pack as lunch, tasting as good at room temp as they do warmed up. I especially appreciate this because I have yet to give in to the whole microwave trend and have to use my oven to warm things up which is sort of a negative experience on hot summer days. Instead, I take a slice of spanakopita out of the fridge about 30 minutes before I want to eat and try to let it come to room temp before attacking it with my fork. Sauté onions in a large and deep skillet over medium heat until they begin to brown. Add garlic and cook for a few minutes or until fragrant. Add greens, a few handfuls at a time, and cook for about 4 minutes until wilted and bright green. Season with salt and pepper. Set aside and let cool. Oil a 9×9 glass baking dish. Lay a layer of phyllo in the dish, paint with olive oil, and top with another layer, being sure to cover the sides of the dish but trimming overhang. Repeat until 6-10 sheets are in the bottom of the pan. If you have never used phyllo, or could use a refresher, I recommend watching this video from the BBC that explains how to use it! Scoop in filling, spreading with a spatula . Repeat phyllo layering on the top of the dish, tucking the edges in around the filling. Slice the phyllo all the way through to the filling in 3-4 places. 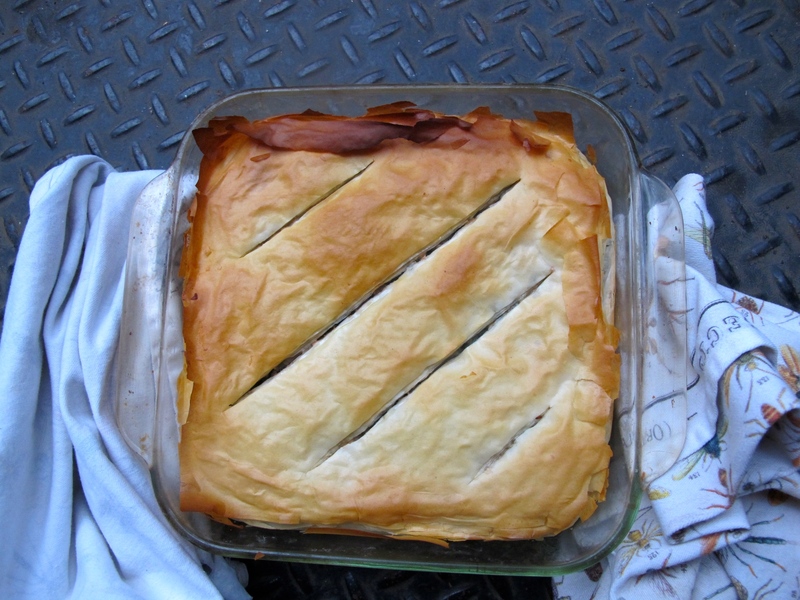 Bake spanakopita for 30-45 minutes or until the pastry is browned and flaky!